Elite Trimworks medallions, brackets and art niches are made of solid, rigid polyurethane foam. As a bonus, they come fully primed and painted, and if desired, they readily accept any paint that you choose. A Ceiling Medallion or Ceiling Centre is the perfect option for anyone who wants to dress up an otherwise boring light fixture or room, especially one with a 9 foot ceiling!. They come in a variety of shapes and sizes to suit everyone's needs. We have an assortment of medallions that match perfectly with our selection of mouldings. As a rule of thumb, the ceiling medallion should be approximately the same size as the light fixture below. In a narrow space, such as a hallway, consider a small 15 to 20" diameter ceiling medallion. Dining Rooms or Kitchens often suit a medium sized 25 to 28" medallion. Elite Trimworks ceiling medallions offer an affordable alternative to high-priced plaster! They are less expensive to buy, ship, and most importantly, install easier with no special skills required. They are also easy to ship and install. 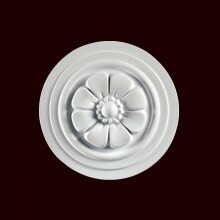 All of our ceiling medallions have 4" diameter center hole making them adaptable to a ceiling electrical box. Elite Trimworks Inc. is a leading provider of polyurethane architectural mouldings and architectural elements. Elite Trimworks products are maintenance free, have deep, crisp, impeccable detail and add both value appeal to any home. Choose from an extensive array of designs and sizes. Ceiling Medallion, Egg & Dart 17 1/4"